Transport links were cut and power was down in parts of northern Britain as Storm Xaver passed through on its way to Europe. Meteorologists have warned that this hurricane-force wind could be the worst Europe has seen in many years. In Britain, authorities will shut the Thames Barrier as they warned the nation of “the most serious coastal tidal surge for over 60 years in England.” The Prime Minister David Cameron called several meetings to discuss the situation. When the storm hit Scotland and parts of England, two people were killed as winds reached 140mph. The first was a driver whose lorry overturned and hit other vehicles in West Lothian, Scotland. In Nottingham, a second person died in Nottingham when a tree came down due to the ferocious winds. Power cuts affected more than 100,000 homes in the country. A report from SSE showed that 80% of those affected were in Scotland. Production of North Sea oil and gas was stopped by Statoil and ConocoPhillips as staff were evacuated, and Scottish train services were cancelled across the country thanks to debris on the lines. Lifeboat crews had to perform rescues from homes flooded in north Wales during the morning and the Environment Agency issued 41 severe weather warnings all in the highest category. 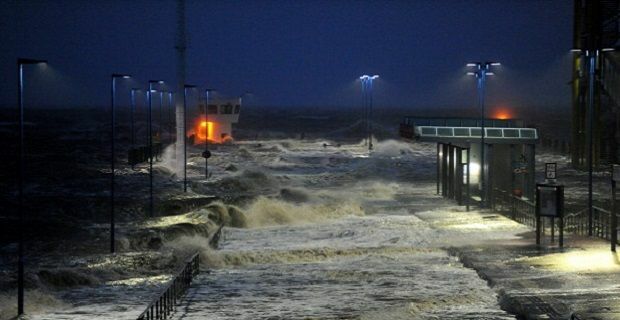 More than 15,000 residents were asked to evacuate areas of the east coast as sea defences may not hold. The disasters that Britain’s faced today will be felt in mainland Europe tomorrow and into the weekend. Hamburg, Germany is preparing for the storm by cancelling 120 aeroplanes from the city’s airport and additional cancellations are expected. Christmas markets have been closed and many schools are also affected by the approaching weather.